People often ask me how I created some of my most recognizable commercial advertising photography. This blog is my answer to many of the technical questions that I receive. I don't often have time to add articles to this blog, but do manage to update it occasionally. I am writing this particular post in response to the most common question that I get about the image above. How did you do that? This image was a fun one to shoot. It helps to have the owner of the best coffee roaster in the front range, Cody Osborn of Proper Grounds in Lafayette CO, helping me out on this one. The idea was rather simple. Create an image that represented the coffee process from bean to cup, and represent it in a way that illustrated Cody's love for coffee and artisanal approach. We threw some ideas around and settled on the idea of the coffee beans transitioning from Cody's hands, into coffee grounds as they fell, and finally into coffee splashing into a cup. Having many comped images over the years, it was no mystery to me how we were going to pull off the shoot, although it ended up being a 'wait and see' moment for Cody. Capture a few photos of Cody pouring coffee beans from his hands in to the cup. Capture a few more photos of Cody pouring coffee grounds from his hands. 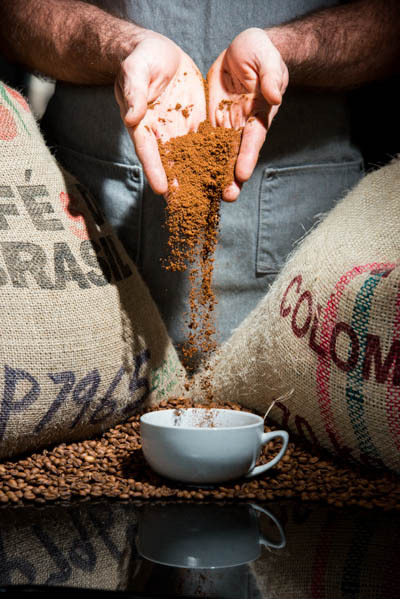 Capture a few images of the coffee being poured out of a container into the cup. I knew that we wanted to capture the splashing of the coffee when it hit the cup, so I had to either use the speedlights at a very low power setting, or take advantage of the high-speed sync that the Pocket Wizard system was capable of. I knew that I wanted to control the light in the room completely, which meant that I had to go with the second option of high-speed sync. Once I knew how I was going to stop the action of the coffee splashing out of the cup I proceeded to set up the props and lights. It was important to determine how the coffee was going to be captured so that I could utilize the same settings for the beans and grounds. 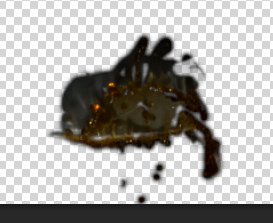 Normally I wouldn't necessarily shoot the other substances at such a high speed, but I knew that if I wanted the images to blend seamlessly when I was assembling them in Photoshop, I had to establish the common denominator for the lights. The beans and the grounds were easy. I had Cody pour different amounts of each out of his hands until I got the volume and flow that I was looking for. The liquid was a bit more tricky because we had to experiment with the container that Cody was pouring the coffee out of in order to get the desired volume and spread of the coffee stream. Once we had settled on the container that gave us the best results, I had Cody pour the coffee. And pour the coffee. And pour the coffee. There was a bit of trial and error with hitting the cup as well as my timing the shot. The biggest challenge was cleaning up between pours so that we didn't have a lake on the counter under the cup. Comping the images together was relatively straight forward. I selected the images that contained the components that I was looking for. I used several of the bean pouring, two of the grounds pouring, and a few of the coffee pouring/splashing. Each image was selected for a specific section that I wanted to incorporate. 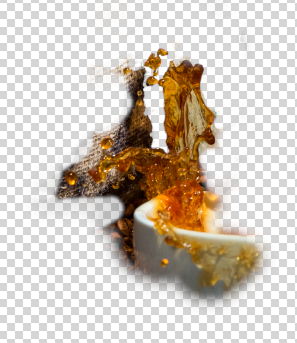 Once I had selected the images I brought them into Photoshop as layers and edited them together using layer masks. If you are interested in learning how to actually composite images in Photoshop, there are many decent tutorials online for learning these techniques. Once I had the image looking good, I added a slight vignette to draw attention to the middle of the image and away from the edges. I hope you were able to get something out of this posting. I have included some additional information about the lights that I use as well as a brief explanation of why speedlights are such an important part of my process. Over the last few years I have been shooting exclusively with Nikon speedlights. I have two SB-910s and two SB-700s that I use in conjunction with speedlight mounts that have Bowens modifier mounts on them. The mounts allow me to take advantage of any light modifier that uses the Bowens mount system, which is quite extensive. I have been using the Pocket Wizard MiniTT1 transmitter with the AC3 zone controller, in conjunction with FlexTT5 receivers to trigger the lights. Not only does the AC3 allow me to adjust the lights right from the camera, it also allows me to turn on each zone independently in order to see what affect the light is having on the scene. This ability is critical to visualizing the shots that I create because speedlights don't have modeling lamps in them. I suppose that one benefit of using speedlights for so long, is that I have learned what to expect from the lights and modifiers. Although I do not have a live preview of how the lights are casting on my subjects, I do have a pretty good idea of what I am going to get before I take the shot. I also feel compelled to mention that I rarely get things set up perfectly. It usually takes a few shots and adjustments to dial everything in. Speedlights have an extremely short flash duration when they are set on their lowest power setting. The flash duration is so fast that it will actually freeze water splashing even if the shutter speed of the camera is longer (i.e. 160th of a second). The quick burst of light actually acts as the shutter, effectively stopping the action. This is one of the common methods used in liquid photography. High-speed sync allows the camera's shutter to control the speed of the exposure. By telling the speedlight to remain on for the entire duration of the shutter's set speed, high-speed sync ensures that the light is on and available for the entire exposure. The real benefit of high-speed sync is that I can use the speedlights at their highest setting if the shot requires it. For the love of coffee. 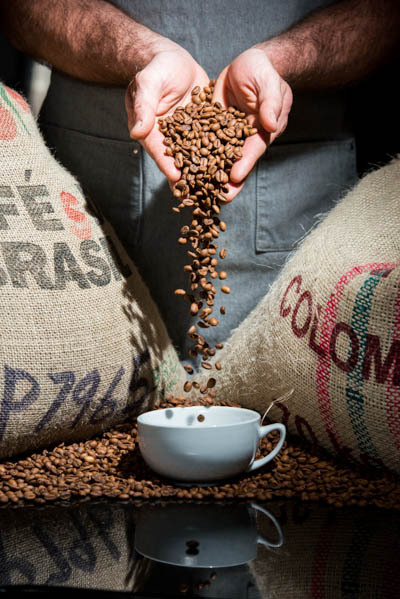 Seeing as how it is National Coffee Day, I thought it would be appropriate to talk briefly about the photo shoots that I have been doing with Proper Grounds Coffee Roasters in Lafayette Colorado. Last Spring I was sitting with three of my four children in Proper Grounds while we waited for my second son to finish some work at school . It was a chilly day so I ordered hot cocoa for the kids and a latte for myself. A few quick observations about Proper Grounds. Experience is everything. They are very personable and care deeply about providing the most relaxing environment possible in which to enjoy your beverage. Flavors beyond compare. They are awesome at coming up with the perfect flavor combinations. I asked for a latte that tasted like an almond joy and ended up with a wonderful blend of cocoa, coconut, almond, and espresso. That personal touch. They always take the time to create some sort of art with the foam. I had some sort of swirly leaf thing, my daughter had a heart, one of my sons had what to appeared to be a Native American Indian Chief, and my other son had a swan. The kids were so enamored with the art that I didn't think that they would ever drink their cocoa. I took some photos with my phone so they could remember the occasion, and they consumed their beverages. On a whim, I went up to the counter and told the barista that I would love to photograph some of the latte art that they create and handed him my business card. To my surprise he directed me to one of the tables in the shop where Cody Osborn, one of the owners of Proper Grounds was sitting. To make a long story short, what started as a simple request to photograph turned into a wonderful, reoccurring, creative, free-form photographic exploration of the entire world of coffee. To this day, Cody and I are still carving time out of our schedules to get together and just create images around coffee. I wrote this article on SLR Lounge's forum some years back. When I went to their current website I noticed that the forums are no longer there, so I decided to post it here. When I got into photographing artists, entertainers, and concerts I had never even considered the prospect of shooting a deejay based event. I had never been to a rave, or any other type of EDM show, and didn't have any interest in the live aspect of the genre at all. Who knew that I would end up shooting my fair share of EDM shows, and loving it. There is no band to watch, so the event is all about the music and the visuals. The music is loud, energetic, and usually sounds incredible. The visual aspect is all about the multitude of colored lights, video projections, lasers, and strobes, all moving about and pulsing with the music. Occasionally there will be dancers or other performers as part of the show, but don't count on it. The coordinated effort, when done well, is really quite impressive to see. Ultimately, sharp focus, good composition, and capturing the compelling moments are the goal. But what do you need to consider in the process? Here is a rundown of my most used settings. As with anything creative, experiment for your self, it's the only way to truly learn what works best for you. The challenge is capturing the deejay and the crowd, without using a speed light, while everyone is bobbing about, poorly lit by spastic, unpredictable swaths of light. Because the lighting and environment are so unpredictable, I usually set my cameras to auto ISO. There are some concerns that 'auto ISO' can harm the camera with prolonged, constant use, but this is a risk that I have decided to take. There is no way to manually meter the scene, set the camera appropriately, and get the shot, all before everything changes. Expect low ISO noise. Not every shot will have it, and sometimes you will end up with very artistic results. I have had consecutive shots within a second of each other where one ISO was at 400 and one was at 25,600. You can't control the environment. All you can do is be prepared to capture whatever happens. Because of the constantly changing color, direction, and intensity of the different lights, I always set my camera to -1 stop Exposure Compensation. I would rather have to recover details that are too dark, than loose details because the image is blown out. Stopping motion is important. When the girl in the front row swings her hair back, or the deejay jumps and swings his arms wildly in the air, you want to be able to stop the action. I always shoot on shutter priority with the shutter speed at no lower than 200th of a second. More often than not I am shooting at a shutter speed of 400th of a second. If I am shooting with a long lens I will run my shutter at no slower than 320th of a second. There is a general rule that suggests limiting your shutter speed to your lens length, for example, shoot at 200th of a second when shooting with a 200mm lens, but that doesn't stop quick motions, it just minimizes blur from hand held shots of slow-moving or still subjects. You need to shoot fast enough to stop the action. That said... Rules are made to be broken. The image below was captured by stabilizing the camera and shooting with a longer shutter speed in order to illustrate the motion of the dejay. And this one was done by zooming the lens in conjunction with a longer shutter speed. The most challenging thing about EDM shows is focusing in low light. Auto focus can be a bear, especially with the AF assist light turned off. My D800 does a decent job of pulling focus most of the time, but it can be unpredictable. The upside of EDM shows is that deejays don't generally drift around much. Pick a spot, manually focus, and shoot away. This approach is better than letting your auto focus zip frantically in and out and never getting a shot at all. Getting a mix of close-ups and wide shots is important to capturing expression and emotion, as well as establishing location and representing the overall energy of a show. Depending on the client (venue, artist, publication, etc. ), there may be a directive to capture crowd photos as well as ones of the artists. I use two camera bodies, one with a 14mm-24mm 2.8 and the other with a 70mm-200mm 2.8 lens. I carry a 24mm-70mm 2.8 and a 50mm 1.4 lenses in my backpack just in case I have a need, but the other two lenses stay on my cameras for the majority of the show. Keep your client in mind. Understand their needs, and any plans that they may have for the photos. A lot of online publications use crowd photos to entice their users to tag themselves at the event, and ultimately to gain new followers or customers. Artists, on the other hand, like to see photos that make them look like a 'Rock Star' at a festival. Shoot appropriately for your assignment. Observe your surroundings. People are predictable. They usually repeat their favorite behaviors, in this case dance moves or gestures. Watch how the crowd and deejay move when the music swells. What do they do when the 'bass drops'. When you observe, you learn. When you learn, you are able to anticipate. When you are able to anticipate, you have a better chance of capturing that stellar shot. Most of all, keep your head, don't stress, learn from your mistakes, and have fun. Shutter Priority with an appropriately high shutter speed.